Amaranthine Flowers By Design brings you this gorgeous Purple Splash Bouquet, a fresh design filled with seasonal blooms like roses, chrysanthemum, disbuds, delphiniums and lush green foliage. 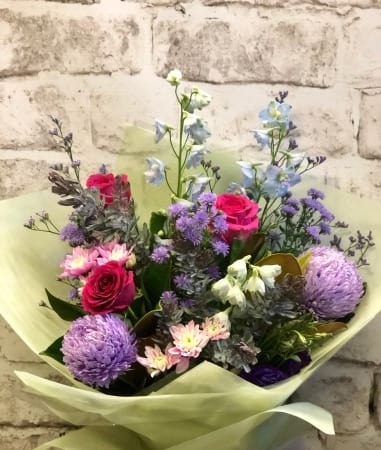 Say I love you, Our thoughts are with you or Happy Birthday with this stylish bouquet in fabric wrap and delivered in a convenient temporary vase. A beautiful addition to any room or office from Amaranthine Flowers By Design. Your local florist in New Lambton, Newcastle.